Karachi: OPPO, a leading Global Smartphone Brand dedicated to providing products infused with art and innovative technology, this week officially announced Find X, marking the return of its highly regarded flagship Find series. 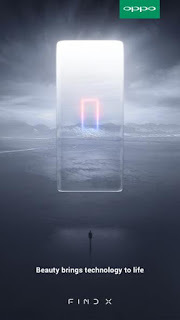 OPPO Find X launches on the evening of June 19 local time at the world famous Louvre in Paris. It will be launched soon in South Asia. As one of the forerunner phone brands to make "photography" a key R&D direction, OPPO has been advancing photography technologies for years. In January 2018, OPPO announced the 5G pilot program in cooperation with Qualcomm Technologies. Later on May 10, the OPPO Global Research Institute (Shenzhen) successfully demonstrated the World's First 5G Video Call Demo using 3D Structured Light Technology.